These lousy midi can annoying you. This Intro is finally done with around 3-4 minutes playtime, just to get the storyplot. The beginning is partially built with cutscenes and is partially playable. After that it's time to hit the worldmap. This is the first version I came up with. The buildings are clickable to enter the stage / map. The space scrolls and includes all real star signs from the 12 month horoscope. [flash=640,480]https://www.youtube.com/v/jeeCKfsR3ts/flash] Just add the "[" to close the bracket at the end. Coming along nicely. Allright community, I had some troubles with stencyls, better said Javas, max memory usage. Took me a while to fix this, demotivated on continuing the work. For me trhe tutorial on how to fix the problem didn't work, the file to replace in stencyls install folder is a pure text file so I can't use it to launch stencyl with a higher RAM. Anyways, I've finished the raw foregrounds and backgrounds for the forest maps. Here you can see 3 hours fastforwarded withing 5 minutes. And the final result. 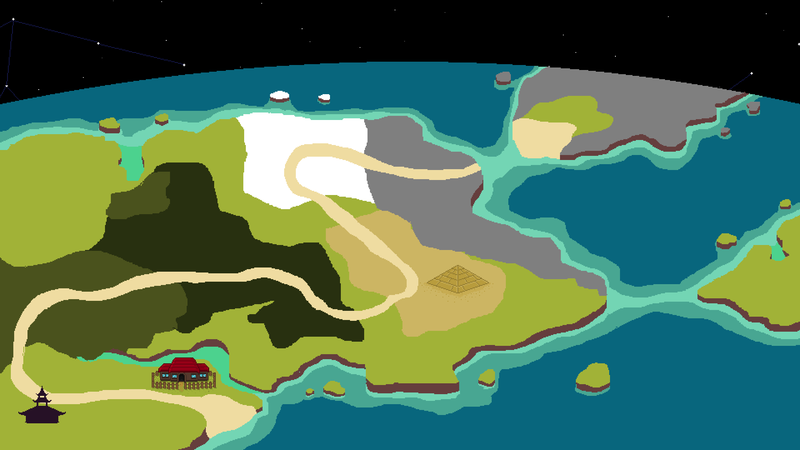 Details for the back- and foreground will follow later and of course the tileset is still a placeholder. If you saw the last video you will notice a change in the backgrounds, I didn't like the friendly style with all the clouds and stuff so I changed it and finally started to work on the first tileset for the forest map. Enjoy. Looking pretty neat! Try using parallax layers for the vines. Make things on different layers scroll at different speeds.. this will show depth. Layers closest to the player scroll fastest.. layers farther away are slower. Looks great so far. Did you end up getting the RAM issue fixed? I usually just modify the original launcher rather than downloading a new one. Change the line -Xmx###m \ to whatever amount you want. Mine is set to -Xmx24072m \ which will reserve 24GB memory. Just don't reserve more RAM than your machine actually has, and leave some for your other programs. @squeeb I think the vines are part of the structure holding up the platforms. At least, that's how it looks to me. I allready use paralax scrolling but it's set up quite sensitive. 4 layers with a difference in scrollingspeed of 0.1 otherwise the movement looks too fast. But I will work on that for better results, this example is just to test the tileset. The vines tho are not a background nor a foreground, it's a tile. Some hanging loose and others to hold some of the plattforms. Looks great so far. Did you end up getting the RAM issue fixed? Yeah, finally. Works great now, no issues with max ram anymore, way easier to work with rather than having to restart each 5 minutes. The basic tileset for the forest is done so far as you saw in the last videoupdate. Storybased you will meet an important NPC to talk to who will guide you into an indoor map. As you can see I try to work every day a few hours on the game for efficient progress thus I'd like to introduce you to the the first version of the forest indoor tileset. The first set of tiles for the indoor forest house didn't satisfy me. I've redone some of the tiles and added a few more. What else belongs into a lumberjacks hut? i think it already looks pretty cool. I would separate more between "what you can jump on" and what not. Right not its not so easy to read.